Writer on Jewish history mentioned in Eusebius, "Præp. Ev." ix. 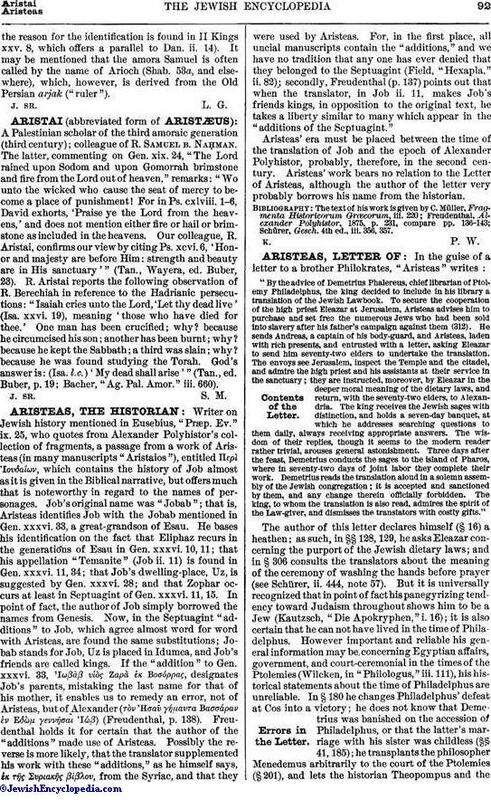 25, who quotes from Alexander Polyhistor's collection of fragments, a passage from a work of Aristeas (in many manuscripts "Aristaios"), entitled Περὶ Ιουδαίων, which contains the history of Job almost as it is given in the Biblical narrative, but offers much that is noteworthy in regard to the names of personages. Job's original name was "Jobab"; that is, Aristeas identifies Job with the Jobab mentioned in Gen. xxxvi. 33, a great-grandson of Esau. He bases his identification on the fact that Eliphaz recurs in the generations of Esau in Gen. xxxvi. 10, 11; that his appellation "Temanite" (Job ii. 11) is found in Gen. xxxvi. 11, 34; that Job's dwelling-place, Uz, is suggested by Gen. xxxvi. 28; and that Zophar occurs at least in Septuagint of Gen. xxxvi. 11, 15. In point of fact, the author of Job simply borrowed the names from Genesis. Now, in the Septuagint "additions" to Job, which agree almost word for word with Aristeas, are found the same substitutions; Jobab stands for Job, Uz is placed in Idumea, and Job's friends are called kings. If the "addition" to Gen. xxxvi. 33, Ιωβἁβ υἱཹς Ζαρἁ ἑκ Bοσόρρας, designates Job's parents, mistaking the last name for that of his mother, it enables us to remedy an error, not of Aristeas, but of Alexander (τླྀν Ησαῦ γήμαντα Βασσάραν ἐν Εδὼμ γεννῆσαι ώβ) (Freudenthal, p. 138). Freudenthal holds it for certain that the author of the "additions" made use of Aristeas. Possibly the reverse is more likely, that the translator supplemented his work with these "additions," as he himself says, ἐκ τῆς Συριακῆς βίβλου, from the Syriac, and that they were used by Aristeas. For, in the first place, all uncial manuscripts contain the "additions," and we have no tradition that any one has ever denied that they belonged to the Septuagint (Field, "Hexapla," ii. 82); secondly, Freudenthal (p. 137) points out that when the translator, in Job ii. 11, makes Job's friends kings, in opposition to the original text, he takes a liberty similar to many which appear in the "additions of the Septuagint." Aristeas' era must be placed between the time of the translation of Job and the epoch of Alexander Polyhistor, probably, therefore, in the second century. Aristeas' work bears no relation to the Letter of Aristeas, although the author of the letter very probably borrows his name from the historian. Schürer, Gesch. 4th ed., iii. 356, 357.